"When used in nested transactions, commits of the inner transactions do not free resources or make their modifications permanent. The data modifications are made permanent and resources freed only when the outer transaction is committed. Each COMMIT TRANSACTION issued when @@TRANCOUNT is greater than 1 simply decrements @@TRANCOUNT by 1. When @@TRANCOUNT is finally decremented to 0, the entire outer transaction is committed. Because transaction_name is ignored by the Database Engine, issuing a COMMIT TRANSACTION referencing the name of an outer transaction when there are outstanding inner transactions only decrements @@TRANCOUNT by 1. The Database Engine increments the transaction count within a statement only when the transaction count is 0 at the start of the statement." 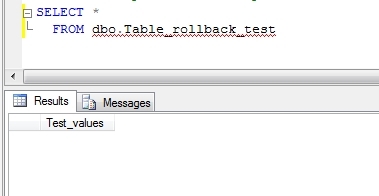 "ROLLBACK TRANSACTION without a savepoint_name or transaction_name rolls back to the beginning of the transaction. When nesting transactions, this same statement rolls back all inner transactions to the outermost BEGIN TRANSACTION statement. In both cases, ROLLBACK TRANSACTION decrements the @@TRANCOUNT system function to 0. ROLLBACK TRANSACTION savepoint_name does not decrement @@TRANCOUNT."